WASHINGTON -- Top U.S. lawmakers tasked with an oversight role in the NAFTA negotiations are expressing confidence in the state of the discussions, downplaying talk of a halting start to the process. "I think we're gonna get that done," said Orrin Hatch. "I don't know when. But I think we'll get it done — certainly before we finish this year." The countries have set a target for reaching a deal by the end of the year, before Mexico and then the United States become embroiled in national elections. That creates a sense of urgency — the countries are trying to cram more than a half-dozen negotiating rounds into a few months. One suggested the countries declined to even discuss some issues the others considered key. And one outsider briefed on the talks says the United States arrived with text copied from the now-dormant Trans-Pacific Partnership and assumed — incorrectly — that the other countries might simply rubber-stamp it. "It strikes me as the sparring still (being) in the early stages," said Sen. Ron Wyden of Oregon. The softwood lumber hardliner, however, cautioned that he would oppose an agreement if it includes some kind of softwood settlement that hurts his state's industry. 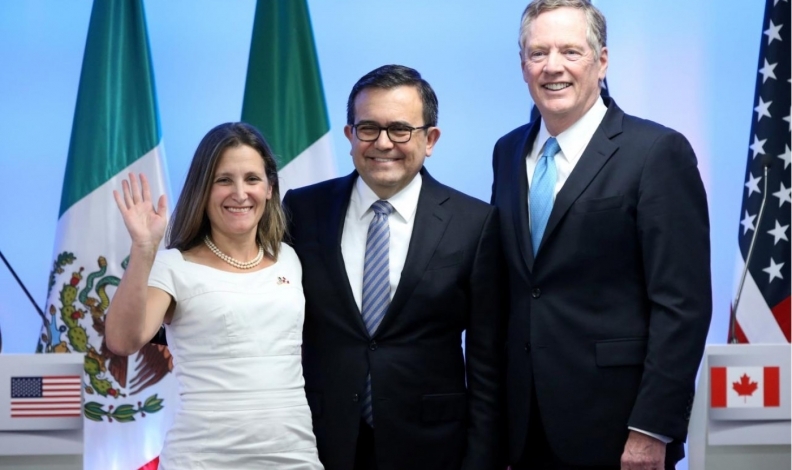 Foreign Affairs Minister Chrystia Freeland would not say whether U.S. negotiators have threatened to withdraw from the talks, as the president has. But she said: "The tone ... has been extremely cordial." She even joked the countries might start their own book club. She said the lead ministers for Canada, Mexico and the United States have taken to discussing their favourite books at the negotiating rounds: "It's a very friendly environment." The next round will be in Ottawa later this month. The talks then return to the United States and then Mexico. A Canadian trade adviser says the United States might have asked for these negotiations, but it hasn't moved very quickly: "There was a certain paucity of text the United States brought to the table on certain key issues," said Eric Miller, president of Rideau Potomac Strategy Group in Washington. The United States can't assume they will just copy-and-paste those promises into an old agreement. "The TPP language was agreed to in the context of a 12-country agreement. The core benefit for Canada in many respects was market access to Japan," Miller said. "Canada is certainly not wanting to give away concessions it may have made in TPP, for free — lest the United States come in and say well we'll take TPP as a starting point and push for something further. Where you set the baseline is incredibly important."